Software Test Attacks to Break Mobile and Embedded Devices presents an attack basis for testing mobile and embedded systems. Designed for testers working in the ever-expanding world of "smart" devices driven by software, the book focuses on attack-based testing that can be used by individuals and teams. The numerous test attacks show you when a software product does not work (i.e., has bugs) and provide you with information about the software product under test. The book guides you step by step starting with the basics. It explains patterns and techniques ranging from simple mind mapping to sophisticated test labs. For traditional testers moving into the mobile and embedded area, the book bridges the gap between IT and mobile/embedded system testing. It illustrates how to apply both traditional and new approaches. 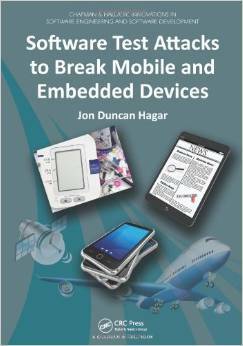 For those working with mobile/embedded systems without an extensive background in testing, the book brings together testing ideas, techniques, and solutions that are immediately applicable to testing smart and mobile devices.